A little bit late to the favourites posting game but I guess I just didn't want to actually accept the fact that it's July already! I don't want to be that person but holy crap how is it even July and where is the year even going! I don't want to think about it too much but you guys, HOW!? Moving forward, I personally love June, it's the start of Winter for us Aussies which translates to fluffy blankets and ugly bed socks- my fave. June was also a pretty great month all and all, I finally graduated from my first university degree! I say first because at the moment heaven knows what I am doing with my life and there might be a second degree in the future (but hopefully not a third...) It was a pretty great evening but now sh*t is finally getting real and I need to start doing something meaningful with my life! 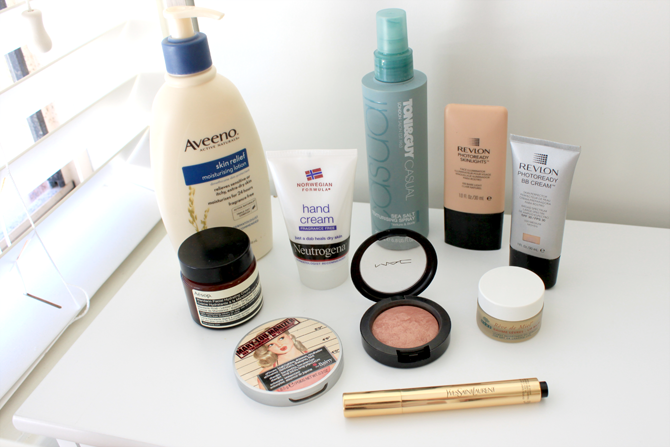 Eugh, but enough of that existential stuff and on to what products I was loving in June! Like I said, June means Winter which also means gross Winter skin, which then also means me stepping up my hydration game, big time. My skin like I mentioned in my Skin Story post, is a pesky little thing and pretty much anything if I am not careful will cause my skin to breakout. So you know you've got a good thing going when this doesn't happen. At the moment my skin is getting along with the Aesop Mandarin Hydrating Facial cream, which I apply generously before bed. It's fairly thick but it is absorbed really quickly and doesn't leave my skin feeling greasy just well moisturised. I love apply facial creams like this Winter because my skin gets quite dehydrated after dealing with heaters and wind all day long. While my skin is quite oily it's also quite dehydrated and this really starts to show unless I keep it well moisturised. Some more products I loved during June to keep my skin hydrated and healthy was Aveeno Skin Relief Moisturising Lotion* and Neutrogena Hand Cream. * I'm not a big fan of using heavily scented lotion and hand cream during the day (I save that for night time) and these two have been great for that. They are fragrance free and keep my hands and the rest of my body well moisturised and soft. The Aveeno lotion has been clearing up some dry patches on my chest as my skin in that area can get quite itchy. The hand cream is kinda gel like in appearance but is absorbed quickly allowing me to get on with the rest of my day. For my lips I have been reaching for Nuxe Reve de Miel lip balm. I won't say too much because I have a post coming up soon about it but it is worth every cent and every piece of hype it receives. I love using this just before I go to bed. In terms of makeup I've really been loving a light and glowing base. My two favourites to achieve this is the Revlon Photoready Skinlights in 100 Bare Light and the Revlon Photoready BB cream in Medium. These two in combination are a great team and give me the look of fresh illuminated skin but with a medium amount of coverage. I've also been pairing this with The Balm Mary-Lou Manizer illuminater and YSL Touche Eclat in the shade number 2. Some people in the blogging community aren't too fond of Touche Eclat but I personally love it and feel that it does wonders for my dark under-eye circles. For a bit of colour I've been using a MAC Mineralize Blush in Warm Soul, which I mentioned in my MAC Haulin' post. It's a great blush that I've come to love that gives a very natural flush of colour. Lastly, for days where I couldn't be bothered blow drying or straightening my hair I just spritz some Toni & Guy Sea Salt Texturising Spray into it and scrunch it up a bit and get lovely loose wavy hair in no time. So that's it for my June Favorites, I guess I'll be writing about my July favorites real soon!? What have you been loving in June? I ordered the Nuxe lip balm online and can't wait to get it because my lips have been seriously dry this winter! And it's only the beginning! I hear good things so I can't wait to try! Also, how AMAZING is Mac Warm Soul? I'm still using mine like, almost every day haha. It's been months since I bought it! Hands down one of my favourite blushes to date. So perfect. And yes, this year HAS been flying by. So much more than other years! And congratulations on graduation, that is so exciting!! I really want to try the YSL touché éclat illuminator, it sounds like such a good product for highlighting the under eyes! The Mary-Lou Manizer is gorgeous! and that MAC blush in warm soul is definitely going on my wish list now! I just stumbled along your blog and I'm really loving it. It's so nice and I love reading it! All those products sound so awesome! Congrats on your first degree!! I've been wondering about that Aesop moisturiser, sounds like a winner for tricky skin (which mine is being at the moment gah). I've just picked up the Cindy-Lou Manizer but I keep hearing so much about the Mary-Lou I think I'm going to have to get that as well... I'm so easily enabled ha!